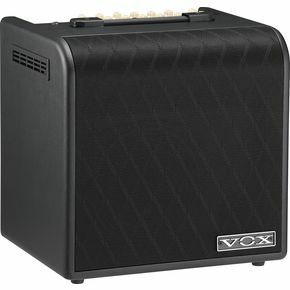 One only expects the best from Vox, and this amp is no exception. This Vox AGA70 has two channels for a really accurate sound. It uses a normal and pre tube channel with enough power to deliver your performance to a fairly large venue. It comes with reverb, chorus, and anti feedback control with 70 watts of power. This amp can deliver different sounds by adjusting the contour knob; it can render a “blues”or “silky” sound, depending on the setting. The speaker is 8" and you can even plug in your mic to the tube preamp. The sound quality of the mic through the tube preamp is very good. With the equalizer settings on both channels, you can get your ideal sound for both the guitar and mic. See more great acoustic guitar amp reviews at Acoustic Guitar Amps.